It was to our Finnish friends in the north of Europe that Bri. Dipamrita went to give Amma’s IAM Technique meditation teaching. The retreat took place in a lovely school in Helsinki, with snow generously present in a countryside that seemed to be emerging from a fairy tale. Children had scarcely left the school before 140 people arrived to receive the meditation initiation. The site was quickly made fit for the session. An altar to Amma was erected, and sound and video systems complete with a big video screen were installed in the gymnasium where the courses took place. Classrooms were converted in dormitories, the needed food was arranged in the kitchen, and the dining room, where it was easy to feel the presence of the usual school children, was clear and spacious. At 6:30 pm bhajans began with great enthusiasm. Participants came from all over Finland, even from as far as the Polar circle, defying bad weather, cold and snow. It was in an atmosphere of fervour and concentration that Bri. Dipamrita opened the session at 9:00 pm Friday night, with a Finnish devotee helping out with the translation. Everybody that was asked agreed that the two days of the teaching were intense and rich. They were thankful and faces were illuminated by that special, beautiful smile that we can only see in Amma’s blessing presence. 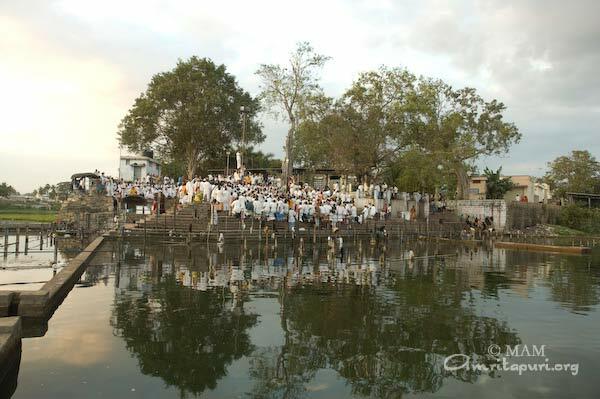 What is special about the Bhavani river? We left Chennai at 8:30 in the morning heading towards Coimbatore, where this three-week South Indian tour would come to an end. At 1:30 PM our party, consisting of six buses and two smaller vehicles, stopped and waited for Amma to join us for lunch. At three, a message came from Mother asking us not to wait for Her, but to eat and proceed with our journey. Even though Mother was still far behind, it was unusual for Her to make Her children sad by not being with them. But this time, She could afford to do that; She had a special surprise in store. She said she would meet us later, and She did catch up with us around six PM. We had a very nice stop by the road during which She asked and answered questions, and then distributed laddus as dark was settling down. When Mother stood up and walked towards Her vehicle, She said: “Next stop Bhavani!” From the beginning of the tour no one had dared to think about the possibility of stopping by the magical Bhavani river. It would have been too sad for one to expect such a precious event and then have those expectations denied. When we reached Bhavani Village, it was already nine in the evening and the place was busy with pilgrims finishing their poori dinners and moving in groups towards their sleeping places. As each bus arrived, everyone rushed towards the door, jumping off in small groups between parking manoeuvres and running towards Mother, who was already by the banks of Her daughter… the river Bhavani. Soon every single one of the 400 devotees and disciples were gathered around the Moon… Amma’s beautiful round and shining face. Up in the clear sky was another luminous one —and in its full shape too. But was it just a reflection? Giving the examples of Mother Cow and Mother Earth, Mother explained that they are worshipped because, receiving so little, they give humanity so much. A cow eats only grass and fodder, yet gives milk. She mentioned that in some cultures, the cow even gives its own life. About Mother Earth, She said that Mother takes nothing from humanity, and yet provides everything, no matter how much humanity may abuse Her. Another question was put to Mother: “Amma, You just said that You actually communicate with subtle beings. Can you please tell us what they say to you?” Would She just answer by laughing or say still more? We waited eagerly…. Bhavani the river, subtle beings seeking peace, the other moon up there and us mortals have one same Mother… That night, She brought happiness and magic to the hearts of all. Can a Mother neglect any of Her children? Throughout the four days of programmes in Chennai, Amma’s devotees there had been asking Her if they could see the video of Her speech in Geneva in the original Malayalam. Now it is the end of the last program in Chennai: five a.m. and darshan is over; people crowd near and onto the stage to bid Amma farewell for another year. But Amma is not quite ready to leave: She stands, calls for a television and VCR, and the videocassette of Her Geneva speech, “The Awakening of Universal Motherhood”. For the next thirty minutes, a stalwart young man balances a TV on his head so that Mother and all gathered on the stage can see it, and Geneva comes to Chennai. Last October, when Mother first delivered this remarkable speech at the Global Peace Initiative of Women Religious and Spiritual Leaders, Her words were received with eagerness and enthusiasm by people from all parts of the world. They are not words applicable only to India; they call out to the hearts of women and men everywhere who yearn for a world in which all people are valued equally, and supported in their efforts to be the best they can be for the world—irrespective of gender. More than half of the world’s population are women. It is a great loss when women are denied the freedom to come forward, and when they are denied the high status that should be theirs in society. When women are denied this, society loses their potential contribution. And on this night, too, Her words were being cherished. Men and women alike listened enthusiastically as their Guru called upon women to awaken to their true potential, and upon men to not oppose but rather to support women as they move forward, gracing the world with their special gifts of patience, compassion and love. Women are the power and the very foundation of our existence in the world. It is therefore crucial that women everywhere make every effort to rediscover their fundamental nature, for only then can we save this world. And how about Mother? Sometimes there was a gaze of deep concentration; sometimes, Her face grew soft with Her unwavering compassion; sometimes, She showed the apologetic laughter of a mother who thinks she may have said something some child doesn’t like! As all listened to Her speech, Mother made comments—imagine this blessing of hearing a live commentary on the scriptures by their own Author! The more a woman identifies with her inner motherhood, the more she awakens to that shakti, or pure power. When women develop this power within themselves, the world will begin to listen to their voices more and more. 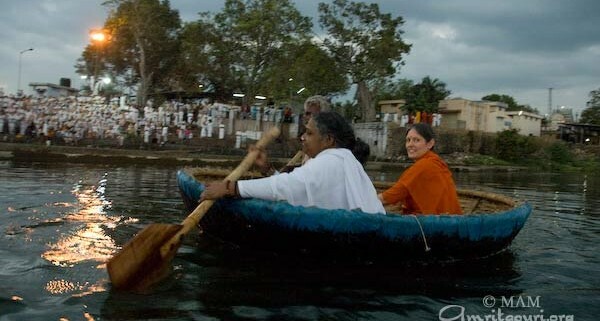 Mata Amritanandamayi Devi Ki Jai! “Upanishad” means literally “to sit at the feet of” When one imagines the dialogues in the Upanishads, one can almost see the disciples seated humbly at the feet of the Master, gathered under a gigantic tree in full bloom. Such was the scene two days ago when, en route to Madras, Amma and Her entourage stopped by the side of the road under just such a flowering tree. Amma served lunch to one and all before speaking about several spiritual topics. The following is excerpted from Her comments. 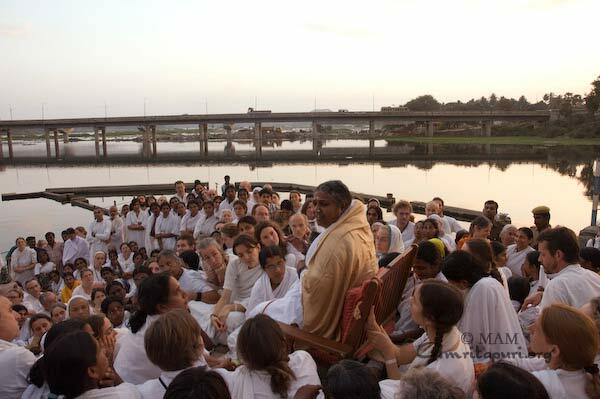 About the do’s and don’ts of spiritual life, Amma referred to the tree that all were sitting under. “When this tree was a small plant, it could have been devoured by any passing animal. Now, it is so strong that you could even tie an elephant to it. It is only because this plant was protected as a sapling that it could grow to become the tree it is today. Similarly, we are beginners on the spiritual path. Therefore we need to follow the rules and regulations for our own protection. Amma’s programme at this legendary island off the eastern coast of India is being held at Her newly constructed housing colony here. Part of Amma’s Amrita Kuteeram project, keys to 108 new homes, were given to homeless families this evening in a special ceremony. Sri Vidya Sagar Rao, The Honourable Minister of State for Home Affairs, was on hand to give an inaugural address and to share with Amma in the presentation of the keys. In his speech, he noted that while 45 billion rupees of foreign fund comes through his office for various religious organisations charitable projects in India, Amma’s institution is the only one to ensure that the money reaches the lowest strata of the society completely. Mata Amritanandamayi Math takes the credit for utilizing their foreign funds for the sake of the poor to the fullest effect. The housing colony, Amritapuram, has a beautiful view of a Shiva temple said to have been consecrated by Sri Rama. In fact, Rameshwaram is home to many artifacts from Sri Rama’s life according the great epic Valmiki Ramayana, including the hill from which he surveyed Lanka before rescuing his beloved Sita from the rakshasa (demon) Ravana. It is said that in order to reach Lanka, Sri Hanuman (a monkey, and the greatest devotee of Sri Rama) led a group of monkeys in carrying large stones into the sea to form a bridge across the water. Many of these stones can still be seen extending into the sea. Today, the programme site bustled with activity as ashramites, visitors, and local volunteers all pitched in to put the finishing touches on the village, begun less than sixty days ago. They formed long chains to pass stones into a small pond that had filled in a construction ditch, recalling the devotion and vigour of Sri Rama’s monkeys as they built the bridge to Lanka. Earlier this year, Amma’s initial goal of building 25,000 houses was surpassed. Her new goal for Amrita Kuteeram is to build and freely distribute 100,000 homes for the homeless over the next ten years. As an extension of Amma’s Amrita Nidhi project, 500 new pensions were also given this evening to destitute women in the impoverished Rameshwaram. Sri Pon Radhakrishnan, India’s Minister for Sports and Youth was on hand for the presentation. Amma gave darshan to 12,000 people before the night was over. What is she doing after darshan? 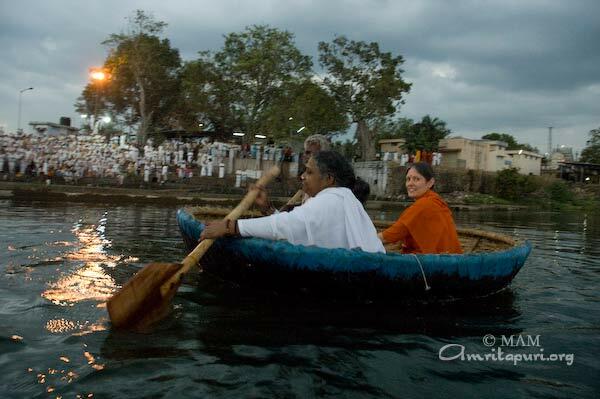 Do you ever wonder what Amma does after finishing darshan? In Sivakasi, after finishing darshan, Amma headed straight for Anbu Illam, Her care home for the elderly located there. She reached the place at 4.30. Even at that late hour, She took time to greet the residents who had been eagerly awaiting Her arrival. They were all dressed in their finest clothes, as they were hoping for a group portrait with Amma. It must have been a blissful moment for the residents, who have come to Anbu Illam because they have no one at home to care for them, or because they have been neglected by their relatives, or simply out of their love and devotion for Amma and their desire to live out their golden years in a spiritual atmosphere. But even after Amma met personally with each of the home’s residents, She did not see fit to retire to Her room. Her sari still stained from giving darshan to 10,000 people that night, She began visiting the resident’s rooms, tidying up here and there. Overall the rooms were well-kept, but Amma found one room that was not very clean. She scolded the man who is in charge of cleaning the resident’s rooms, saying that the residents have no one to look after them, and to look after them is service to God. Amma then took up a broom, bucket, scrub brush and other cleaning supplies and spent nearly an hour showing the man exactly how the work should be done—brushing cobwebs out of the corners, dusting, mopping the floor, cleaning each bar on the safety screen over the windows, scrubbing clean the track in which the window slides. In the process, Amma cleaned this resident’s room until it shone with the love and care She had lavished upon it. What does Amma do after giving darshan? Without taking even a moment’s rest, She goes on giving: loving, serving, teaching—always by example—working tirelessly for the upliftment of the whole world. Only after travelling for several hours, stopping to serve lunch to Her children, giving satsang, singing bhajans, giving darshan to 10,000 people, attending to even the smallest details of the tour’s logistics, visiting Her care home and finally cleaning it, did Amma go to Her room. Except that by then, it was already morning, and another day had begun. Last night in Sivakasi, on Her way to the stage, Amma made Her way through the crowd with a brilliant smile; Her pure white sari shining just as brightly. When She left the stage over nine hours later, the shoulder of her sari was stained a dark rust-red—the residue of Her children’s tears, bindis, make-up—left by the thousands of Her children who had spent a moment in Her arms. But while Her sari was stained, Her smile was still shining as brightly as it had so many hours before, when She first stepped from the car. This is of course not limited to last night in Sivakasi; it is true whether Amma sits for six hours or twenty hours, whether She is Delhi or Dallas, Paris or Tokyo. And this is one of the things that anyone who watches Amma give darshan will surely notice: Her smile never leaves Her for long. She may shed tears, feeling the anguish of Her children as She listens to their sorrows. Or Her face may take on a serious cast as She listens to a devotee explaining His or Her problems, and advises them on the best way to proceed. But Her smile will always return. Even in the midst of scolding a brahmachari who failed to carry out his or her duty responsibly, or discussing spiritual topics or important details regarding the management of Her charitable activities, a smile will frequently steal across Her face. Even when She is being pushed and pulled from every direction as She makes Her way through throngs of devotees, one can see Her eyes lit by a genuine smile. Watching this, one feels that Her smile—the most obvious symbol of Her love, Her knowledge, and the bliss which is Her permanent home—is the substratum of all Her other moods. Amma arrived in Thiruvananthapuram (Trivandrum) this evening. Panchavadyam (traditional festival music of Kerala using drums, cymbals and horns) musicians loudly trumpeted the arrival of the Goddess, while fireworks boomed overhead. Meanwhile the real fireworks were going on below as Amma made Her way through teeming throngs of devotees who have been eagerly awaiting Her arrival, even as many of them worked day and night to prepare Her way. The devotees present must have been hoping for just a glimpse of Amma. But it seems She could not resist greeting Her children personally, as She had only just passed through the crowd to the temple balcony before calling them up for darshan. Finally, over an hour after reaching the ashram, She retired to Her room. On Her way She cast loving looks at Her children below, who themselves could not resist remaining in the temple even after receiving darshan, could not resist one more glimpse of their beloved Amma. Today marks the beginning of Amma’s South India tour.